Carte Generale de Europe Actuelle. 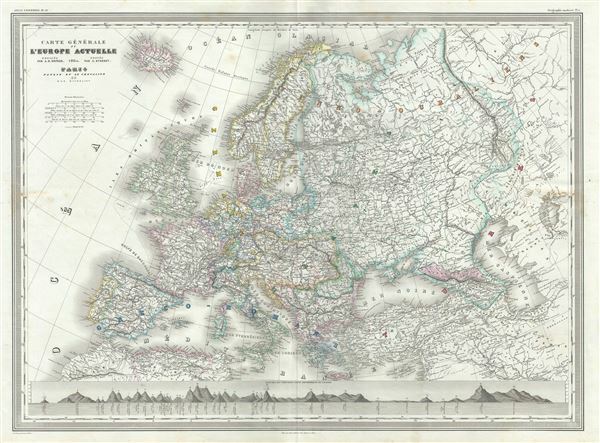 This is a beautiful 1860 elephant folio map of Europe by A. H. Dufour. It covers the entirety of the continent, including Iceland and parts of Turkey, from the Arctic Ocean to the Mediterranean Sea and from the Atlantic Ocean eastward as far as the Caspian Sea. Throughout, the map identifies various cities, towns, rivers and an assortment of additional topographical details. Dufour reveals the Austrian Empire at its height, the many states of the German Confederacy, and a pre-Garibaldi Italy split into numerous small Duchies and states. This map was created during an exciting historical period that witnessed the unification of Italy and saw the British Empire rise to its peak. This map was prepared by Auguste-Henri Dufour and engraved by Charles Dyonette for publication plate no. 11 in Armand Le Chevalier's 1860 edition of Atlas Universel, Physique, Historique et Politique de Geographie Ancienne et Moderne.